Alberto created this in preparation for DesktopX 3.1. It is a master system volume control. I find it very handy, particularly when tied to a hot key to toggle its visibility. I forgot I had this till you reminded me. Now I have the need for it. I like it alot. 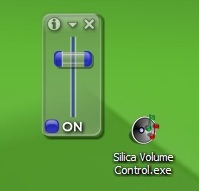 The XP Volume icon didn't show up in my tray half the time. Now it's been retired. A take-off on Fairyy's comment-- I didn't know I needed it. This is so cool, I have where its barely visible on my desktop corner above the sys tray, extremely handy and unobtrusive. This is what everybody was looking for for a long time. It would be a great thing if Author would create something similar to current one but dealing with switching KeyBoard layouts. I am using DesctopX system for half a year and all the time was looking for smth like that. It is very useful to hide Windows default TaskBar and upload DesctopX programs instead. Everything is possible to exchange except KeyBoard Layout. If i didn't use a multimedia keyboard I would jump all over this. great job!